Life is full of big questions : Who am I ? Why am I here ? Why is there suffering ? Is there life after death ? and ultimately, the question we all try to find the answer to, How can I find happiness or peace of mind ? But what if that search for happiness was based on a huge misconception, a misconception that has been drummed into us since birth, that we are separate individuals ? In Who’s Driving the Dreambus ? film makers Boris and Claire Jänsch go on a personal journey through a series of interviews with eminent spiritual teachers, philosophers and writers - in a quest to unravel what it means to be alive. This radical and challenging documentary ventures into the heart of the mystery of identity, flipping the idea of spiritual endeavor on its head, revealing a message so profound and yet so simple that it might just end the search. 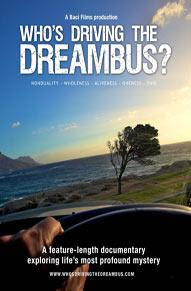 'Who's Driving The Dreambus ?' features interviews with Amit Goswami, Gangaji, Tony Parsons, Genpo Roshi, Guy Smith, Jeff Foster, Toni Packer & Timothy Freke. Source : Who's Driving The Dreambus ? ScaredSacred Movie ... Revealing The Light !